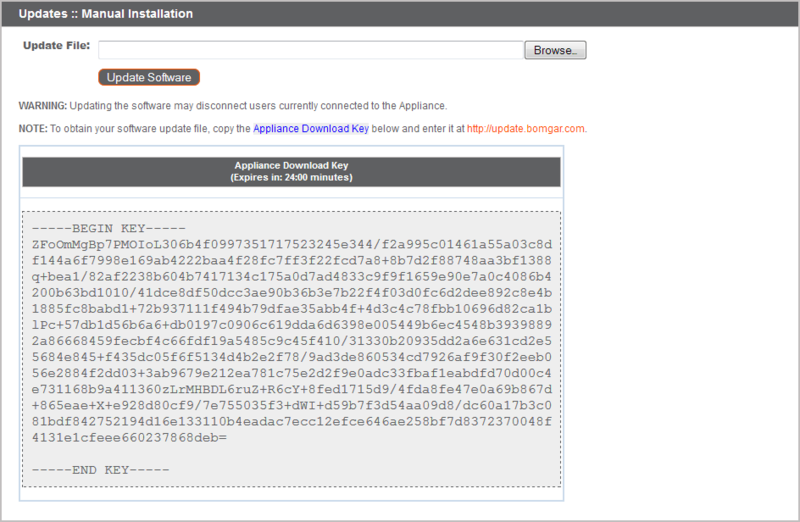 Log into your Secure Remote Access Appliance and go to the Updates page. Starting with Base 3.3.2, click the Appliance Download Key link to generate a unique appliance key; prior to Base 3.3.2, you must contact BeyondTrust Technical Support to request this key. From a non-restricted system, submit this key to BeyondTrust's update server at https://update.bomgar.com. Download any available updates to a removable storage device and then transfer those updates to a system from which you can manage your appliance. If you receive an error, please make sure the time listed on the /appliance > Status > Basics page is correct. Many functions of the Secure Remote Access Appliance, including the Appliance Download Key, rely on this time being correct. If the time is not correct, please check the NTP setting on the Networking > IP Configuration page.